A week ago, Bitcasino has launched a creative Live Football Card Game, which was designed to celebrate the World Cup 2018. This awesome game was just the first step towards pampering players that enjoy cheering for their national teams. Namely, this week the Bitcoin casino operator has introduced users with two new promotions that keep the football craze up and running. The first one offers a μɃ 1,000,000 prize pot for football fans, whereas the second one takes players on an exploration adventure on the exquisite Microgaming video slot Fortunium. 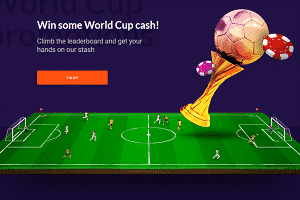 Active until 23:59 GMT of 1st of July 2018, the World Cup Cash promotion at Bitcasino rewards those that will manage to top the leaderboard. Players that want to take part in this exciting competition should simply play their favourite games at the casino. – 2 Points for every μɃ 5,000 wagered on slots. As simple as taking part in this promo is, players may think the prizes may not be worth it. However, this cannot be further from the truth as the main prize is a mouth-watering travel voucher worth μɃ 500,000. The player to end second on the leaderboard will be given a travel voucher worth μɃ 200,000, while the rest eight top-scoring players will get cash prizes between μɃ 50,000 and μɃ 5,000 depending on their ranking. The travel vouchers include return Economy class flights for 2, a maximum of 7 nights in a hotel, agency fee and insurance. Those that will visit Bitcasino should make sure to explore the futuristic city of Fortunium as they may find one of the juicy 164 cash prizes hidden in it. This Golden Opportunity promotion ends at 23:59 GMT on 3rd of July 2018, meaning players have plenty of time to show off their exploration skills. Taking the role of the industrious inventor Maximillian or the acclaimed explorer Victoria on Microgaming’s fresh release, players will simply have to wager μɃ 4,560 on Fortunium in order to earn a prize draw ticket. Those that want to improve their chances of winning a prize can keep playing the game as the number of tickets for the prize draw is not limited by the operator. Regarding the prize pool, players have a lot to hope for as the pot is massive μɃ 4,560,000. The one lucky enough to scoop the first prize will be given a cash prize worth μɃ 910,000. Additionally, there are three μɃ 181,000 cash prizes as well as 10 μɃ 90,000 cash prizes too. Bitcasino has also reserved 20 x μɃ 36,000 cash prizes, 30 x μɃ 18,000 cash prizes and 100 x μɃ 9,000 cash prizes. In other words, the chances to win are pretty high, so feel free to join the thrill at Bitcasino right away.